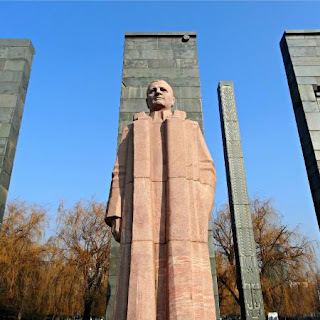 Few communist leaders are still celebrated in Armenia after the collapse of the Soviet Union and the second independence. Alexander Miasnikian is one of them. He was born in Nakhichevan-on-Don (Nor Nakhichevan), the town near Rostov founded by Armenian migrants from Crimea in the late eighteenth century, on January 28 (February 9 in the Gregorian calendar), 1886. Son of a small merchant, he studied first at the diocesan school of his hometown and then at the Lazarian Lyceum of Moscow from 1904-1906. He was attracted by revolutionary ideology as a student, first in Nakhichevan and then in Moscow. Miasnikian formally became a member of the underground revolutionary movement (the Bolshevik branch of the Russian Social-Democratic Party) in 1904 and was arrested and exiled to Baku in 1906. He continued his revolutionary activities, first in Baku and then in Moscow, where he graduated from the law department of Moscow University in 1911. Between 1912 and 1914, he worked as an assistant to a lawyer in Moscow and participated in the dissemination of political literature. His revolutionary nom de guerre was Al. Martuni (“son of fight”). During those years, he also devoted himself to literary criticism and journalism. He edited ten periodicals. He published articles in the 1910s about the meaning of the discovery of the Armenian alphabet and the works of poets Mikayel Nalbandian, Hovhannes Tumanian, Hovhannes Hovhannisian, and Alexander Tzaturian. He wrote many times about the Armenian Question, which he labeled “Gordian knot,” where the disagreements and the interests of the European powers were tied. Miasnikian was drafted into the Russian Army in 1914, where he promoted revolutionary ideas among the soldiers. After the February Revolution of 1917, he became a member of the Western Front’s frontline committee and was elected as a delegate for the 6th Congress of the Bolshevik Party. He later became chairman of the Northwestern Regional Committee of the Bolshevik Party, member of the Military Revolutionary Committee of the Western Region, and commander of the Western Front. In early 1919 he was appointed chairman of the Central Executive Committee and the Bolshevik Party in Bielorussia (Belarus). Miasnikian’s constructive policy led to the formation of state institutions and the economic infrastructure of the republic, stabilizing the internal situation. He actively pursued work towards the eradication of illiteracy and the development of local manufacturing. Many intellectuals exiled in Iran before and after the February uprising returned to Armenia, while many others settled from Constantinople and other places. Many refugees from Western Armenia also started to settle in the country. He voted in July 1921 against the decision of incorporating Mountainous Karabagh into the territory of Azerbaijan, which was fueled by Joseph Stalin.After the creation of the Transcaucasian Federative Republic in March 1922, where Armenia, Georgia, and Azerbaijan were integrated in one political unit, Miasnikian left his position and went to occupy leadership positions in the government of the federation as one of the chairmen of the Executive Committee and later first secretary of the Transcaucasian Committee of the Communist Party. He died tragically on March 22, 1925, when he was departing from Tiflis (Tbilisi) to Sukhumi with Gevorg Atarbekian and S. Mogilevsky to participate in the Congress of the Soviets of Abkhazia. The “Junkers” airplane took fire due to an engine problem and the three men died. They were buried in Tbilisi three days later. Although the official version was an accident, there are views that it was not, and that the incident was orchestrated by, among others, the influential Georgian Bolshevik Laurenti Beria, who had started his career as right hand of Stalin. A factory, a square, and a street took Miasnikian’s name (in Russian Myasnikov) in Minsk, the capital of Belarus. Later, two cities in Armenia and Karabagh were named Martuni after his pseudonym, while a village in the province of Armavir was called Miasnikian. His statue is placed in Miasnikian Square of Yerevan.